Neurons in the brain had been thought to communicate exclusively via the physical connections that are known as synapses, but Caltech researchers say they have uncovered strong evidence that neurons also communicate with each other via weak electric fields, a finding that could help us understand how biophysics gives rise to cognition – the holy grail of neuroscience. The new research, appearing in the journalNature Neuroscience, explains how the brain is awash with electrical activity, and not just from the individual pings of single neurons communicating with each other. In fact, the brain is enveloped in countless overlapping electric fields, generated by the neural circuits of scores of communicating neurons. “These fields were once thought to be an epiphenomenon, a ‘bug’ of sorts, occurring during neural communication,” said Caltech neuroscientist Costas Anastassiou. But the work done by Anastassiou and his colleagues suggests that the fields do much more, and that they may, in fact, represent an additional form of neural communication. Extracellular electric fields exist throughout the living brain, though they are particularly strong and robustly repetitive in specific brain regions such as the hippocampus, which is involved in memory formation, and the neocortex, the area where long-term memories are held. “The perpetual fluctuations of these extracellular fields are the hallmark of the living and behaving brain in all organisms, and their absence is a strong indicator of a deeply comatose, or even dead, brain,” Anastassiou explains. Previously, neurobiologists assumed that the fields were capable of affecting neural activity only during severe pathological conditions such as epileptic seizures, which induce very strong fields. Few studies, however, had actually assessed the impact of far weaker – but very common – non-epileptic fields. “The reason is simple,” Anastassiou says. “It is very hard to conduct an in vivo experiment in the absence of extracellular fields,” to observe what changes when the fields are not around. To get to grips with those effects, the team focused on strong but slowly oscillating fields, called local field potentials (LFP), that arise from neural circuits composed of just a few rat brain cells. 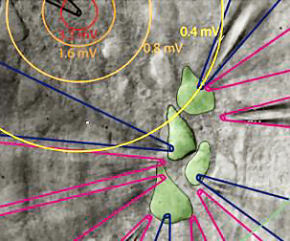 Measuring those fields and their effects required positioning a cluster of tiny electrodes within a volume equivalent to that of a single cell body, and at distances of less than 50 millionths of a meter from one another. He goes further, suggesting that understanding the origin and functionality of endogenous brain fields will lead to revelations regarding information processing at the brain’s circuit level, likely where percepts and concepts arise. Intriguingly, Anastassiou posits that external electric fields could have profound effects on the brain. “Physics dictates that any external field will impact the neural membrane. 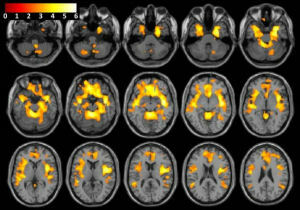 During epileptic seizures, pathological fields can be as strong as 100 millivolts per millimeter [and] such fields strongly entrain neural firing and give rise to super-synchronized states.” And that, he adds, suggests that electric field activity from external fields in certain brain areas, during specific brain states, may have strong cognitive and behavioral effects. In the study, researchers Richard Chi and Allan Snyder found that participants who received electrical stimulation of the anterior temporal lobes were three times as likely to reach the fresh insight necessary to solve a difficult, unfamiliar problem than those in a control group. According to the authors, our propensity to rigidly apply strategies and insights that have had previous success is a major bottleneck to making creative leaps in solving new problems. There is normally a cognitive tradeoff between the necessity of being fast at the familiar on one hand and being receptive to novelty on the other. Chi and Snyder argue that we can modulate this tradeoff to our advantage by applying transcranial direct current stimulation (tDCS), a safe, non-invasive technique that temporarily increases or decreases excitability of populations of neurons. In particular, tDCS can be used to manipulate the competition between the left and right hemisphere by inhibiting and/or disinhibiting certain networks. Their findings are consistent with evidence that the right anterior temporal lobe is associated with insight or novel meaning and that inhibition of the left anterior temporal lobe can induce a cognitive style that is less top-down, less influenced by preconceptions. While further studies involving brain stimulation in combination with neuroimaging are needed to elucidate the exact mechanisms leading to insight, Chi and Snyder can imagine a future when non-invasive brain stimulation is briefly employed for solving problems that have evaded traditional cognitive approaches.